Most days on the motorcycles we took it easy, sleeping in and leaving the motel or hotel around 11 a.m. or noon, and riding at a leisurely pace. We were on vacation, after all. We often ended up traveling after nightfall and I would always ride the Yamaha behind Linda, watching the glow of her Vespa’s brake lights ahead. Night simplifies a motorcycle road and riding after dark transforms common scenes into something more than they are. Sight-seeing aside, long distances on bikes are quickly reduced to basics: riding, eating and fueling up. Ordinary restaurants and gas stations eventually become your best friends, especially at night. 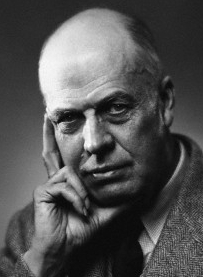 It was night in Mahwah, New Jersey, when I started thinking about American painter Edward Hopper (1882-1967). I hadn’t thought of him till then, and after that I couldn’t stop thinking about him. We were at a strange little Gulf station right out of Lost Highway and we badly needed to refuel. Jersey is a don’t-pump-it-yourself state, but the indifferent attendant said, “yeah, sure,” when I said I’d fill the tanks myself. We were tired and hungry, and there was a McDonald’s next to the David Lynch station, so we went in. It was late and quiet. The place was nearly deserted but a small family sat together a few tables away, talking and laughing and enjoying themselves, untouched by the darkness without. I wondered what it would be like to be among them, but we had to saddle up and move. 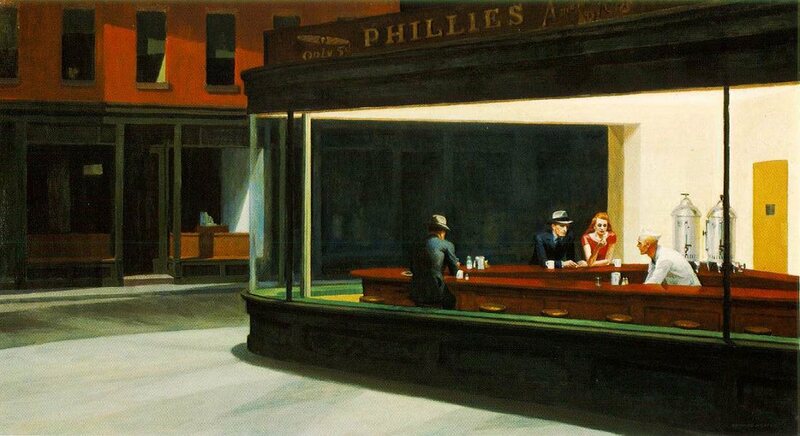 Outside, I saw them again through the sheet glass like a Big Mac version of Nighthawks, Hopper’s famous 1942 oil painting of isolated customers at a late-night New York City diner. I love the color and composition and detail that Hopper put in; it’s one of my favorite paintings. And it seemed Hopper joined our ride after Mahwah, especially during night stops at gas stations or arrivals at motels after dark. Everything at night started reminding me of Hopper scenes, like Gas, his 1940 oil painting of a solitary Mobil station on a country road. 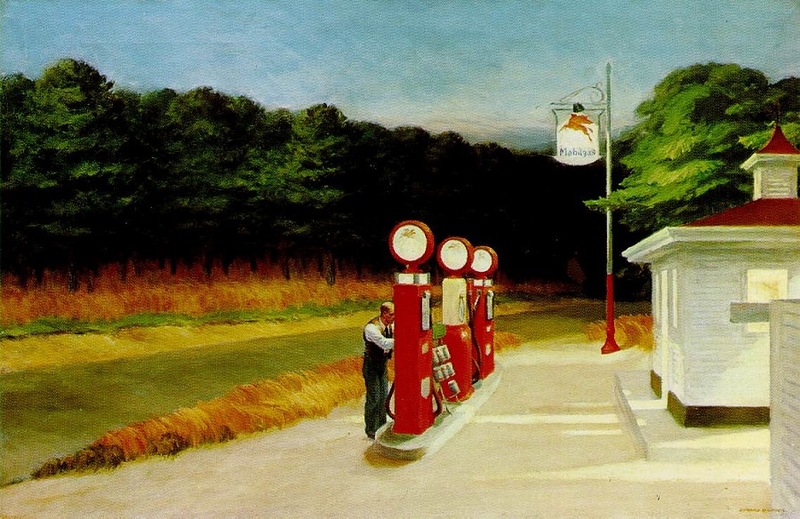 Art historians tell us Hopper’s paintings were social commentary. 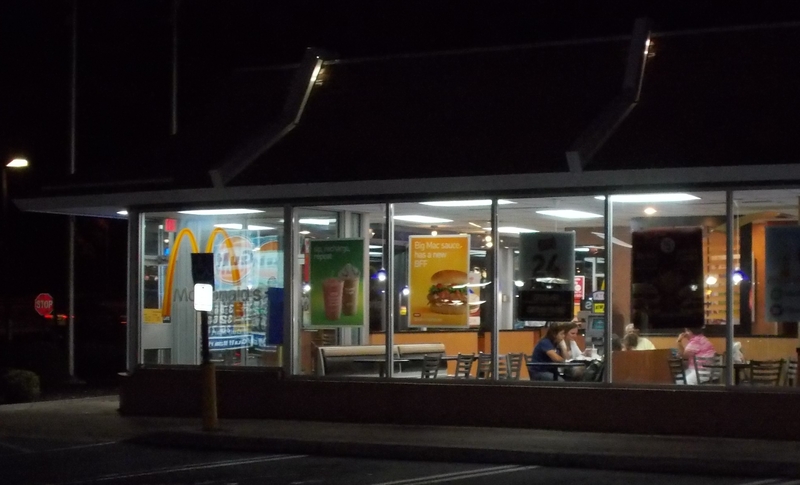 Gas, they say, shows the automobile encroaching on American life, and the overbearing fluorescent lighting of Nighthawks creates a space that both attracts and alienates the viewer. All that’s probably true. Nevertheless, I was grateful for Hopper’s presence during the ride; he helped me see it with new eyes. But I wonder if Hopper’s outlook would’ve been different, if he’d climbed aboard a Harley instead of a 1925 Dodge to travel and sketch across New England. 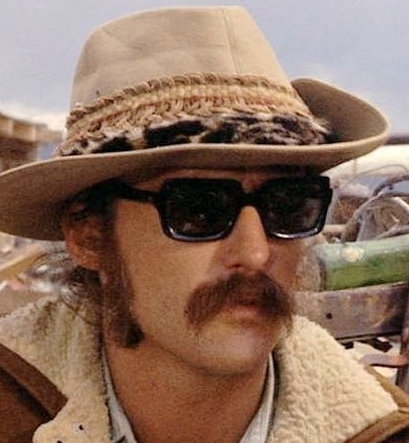 I bet he would’ve appreciated a full tank at the Mobil station, hot coffee with nighthawks at the diner, and the simplicity of a motorcycle road.